Just days before the valiant but ultimately disastrous Warsaw Uprising on the west bank of the River Vistula, the nascent Polish Communist party issued a declaration. Its leaders were east of the river, in Lublin, under the protection of the Soviet army. 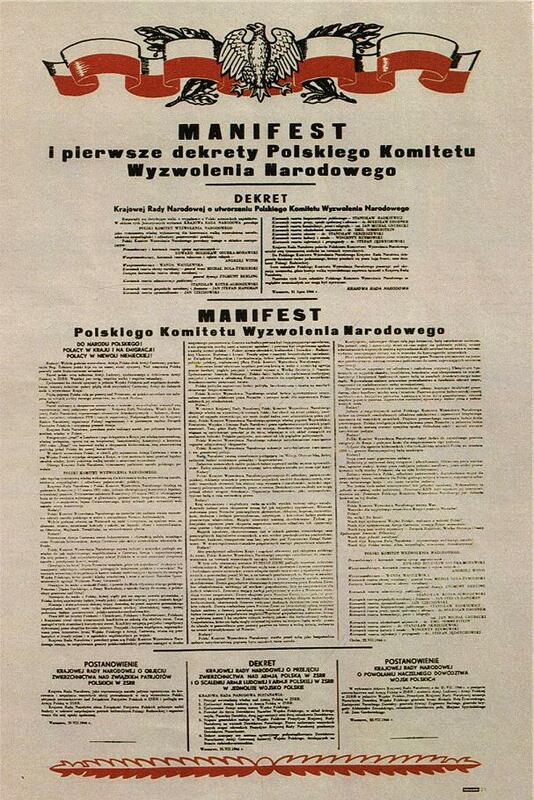 The declaration of 22 July 1944 was headed by the Polish eagle, deprived of its crown, and the words “Manifest i pierwsze dekrety Polskiego Komitetu Wyzwolenia Narodowego (Manifesto and First Decree of the Polish Committee of National Liberation). Within a few years, opposition had been eliminated and the date of 22 July came to symbolise the creation and reinforcement of Poland’s Soviet-backed political structure. Major projects in the rebuilding of Warsaw were often opened on this date. In 1949 it was Trasa W-Z (E-W Route), a road and tram route over the Vistula from Praga, past the (then still ruined) Royal Palace and through a newly-constructed tunnel westwards. This date in 1950 and 1952 also ‘book-ends’ the building of the socialist-realist housing and shopping complex MDM around Plac Konstitucji. In 1955, 22 July was chosen for the opening of the Palace of Culture and Science, Stalin’s ‘gift to Warsaw’, which still towers over the city. 22 July was also an occasion to dish out honours to worthy citizens, from bricklayers to cultural figures. Lutosławski could not escape such attention. 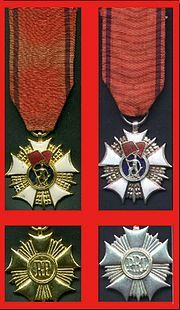 On 22 July 1955 – the same day that the Palace of Culture and Science was handed over – he received the Order of the Banner of Work (Order Sztandaru Pracy), but only Second Class (on the right, below), even though his Concerto for Orchestra had been successfully premiered eight months earlier. Fortunately, there were many more awards from abroad, and later in democratic Poland, that brought Lutosławski pride and joy. 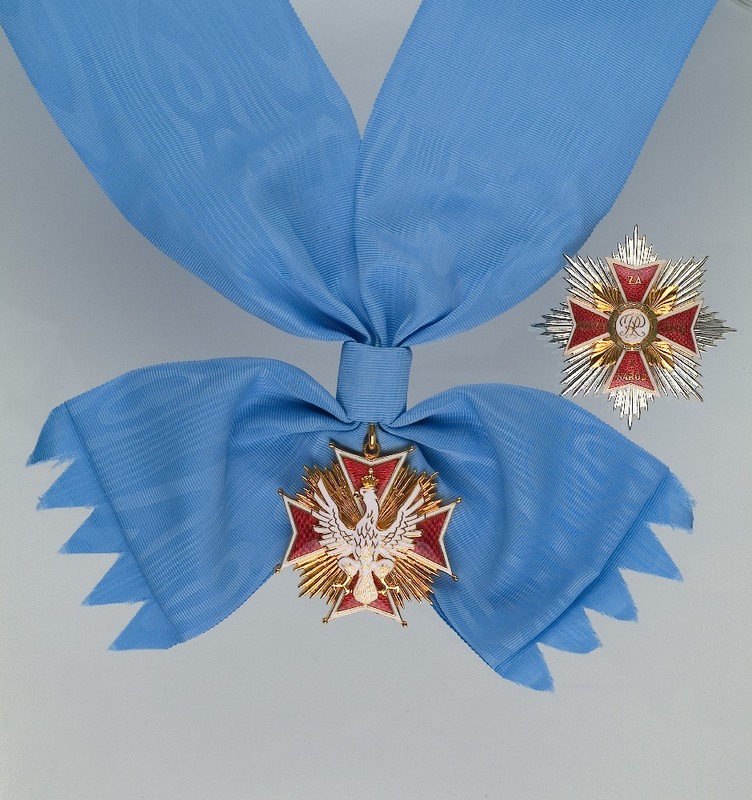 He received the last of these, the Order of the White Eagle (Order Orła Białego), Poland’s highest honour, as he was dying in 1994. (He was only the second person to be so honoured in modern times; the first was Pope John Paul II, in 1993.) It was carried ceremonially ahead of his casket at his funeral a matter of weeks later. The next post in this mini-series – WL100/49: 22 July 1949 and a letter – uncovers an unknown work by Lutosławski. * information from Danuta Gwizdalanka and Krzysztof Meyer, Lutosławski. Droga do mistrzostwa (Kraków: PWM, 2004), 230-31.